By Garett Sloane . Published on September 15, 2016. 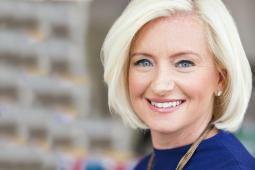 Facebook's Carolyn Everson credited advertisers with helping the social network wake up to the mobile future back in 2012. In a discussion at DMEXCO on Thursday with Nestle marketing chief Tom Buday, Facebook's Global VP-Marketing Solutions recalled the social platform's early crisis as it was going public, during a time when it had zero money coming in from mobile. "We had really an existential moment as a company when we were going public," Ms. Everson said. "We did not have any mobile revenue. We had nothing to offer our clients in mobile and even more so than that, our consumer mobile app at the time was not good." Facebook's mobile deficiency at that point famously dragged the company down at the worst possible time, and Ms. Everson recalled the atmosphere at Facebook, which is a story that has now become industry lore. "We were not a mobile company," Ms. Everson said. "We were a desktop company when Mark [Zuckerberg] started Facebook 12 years ago in his dorm room. Mobile frankly happened to us." Facebook's advertisers like Nestlé were among the earliest voices telling the company it needed to make a harder turn into mobile, Ms. Everson said. "Let me be clear, the Client Council, of which Tom [Buday] was a founding member, frankly told us we need to pay attention to mobile before the lightbulb went off as much as it did in Facebook," Ms. Everson said. "That is how important their feedback has been." The Client Council is a group of advertisers that consult with the social network. It was well known that investors were pressing Facebook on its limited mobile strategy while it was prepping to go public, but the role of brands in nudging the company was not really discussed until now. The speed with which the company addressed its mobile problems has become legend within Facebook as Mr. Zuckerberg reoriented the entire company, a story Ms. Everson recounted from the stage. "Within weeks we had to retrain every engineer, rebuild our apps and really think about how we were going to become a mobile company," she said. The rest is history. Facebook now has more than a billion daily mobile users, and it owns Instagram, with 500 million users, and WhatsApp and Messenger, each with more than a billion users. Last quarter, Facebook made $5.4 billion from mobile devices, which accounted for 84% of its revenue.